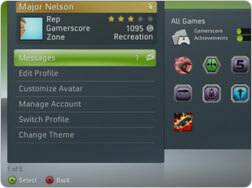 Good news to Microsoft Xbox 360 users now! While current Netflix capable devices are only restricted to SD (Standard Definition) media streaming to home, Microsoft is now working closely with Netflix to provide HD (High Definition) video contents aiming to bring Xbox 360 as a center home entertainment system to increase greater visual and audio experience for users in digital home. According to reliable source, the major Live update service for Xbox 360 scheduled on November 19th will bring unlimited Netflix streaming (which include 300 HD titles) to existing Netflix subscribers. With current subscription cost of around $17 ($8.99 for Netflix and $7.99 for Xbox Live Gold) per month, this will definitely add great value to consumers without further incurring cost for HD media files, competing against Apple TV, VUDU box and other set-top boxes in consumer market. Obviously, this is the right strategy to push more Microsoft Xbox consoles into consumer living room as a non-gamer device by collaborating with famous DVD-by-mail online service provider. According to Microsoft, there is around 30 percent of total of 14 million Xbox Live consumers that would use its consoles as home entertainment system to watch live channels. No further wording on when will this HD media services be made available to other Netflix-enabled devices yet.